The government of Bahrain has banned protests and rallies in the country. Some protests were held this month demanding more rights. Fighting broke out between the protesters and the police, and people were hurt. There were protests in Bahrain last year too demanding changes, and the government had used force to stop the protests. Bahrain is an island country and its capital is Manama. The head of the country is King Hamad bin Isa al-Khalifa. The majority of Bahrainis are Shia Muslims. The King and many of the powerful people in the country are Sunni Muslims. Shia and Sunni are different branches in the religion of Islam. The Bahraini Shias say they are not treated fairly, and many of the protesters are Shias. 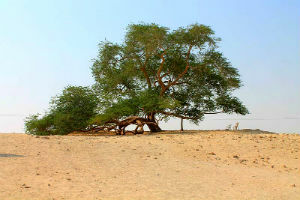 A famous tourist attraction in Bahrain is the Tree Of Life. It is a 400 year old tree that stands alone in a desert.